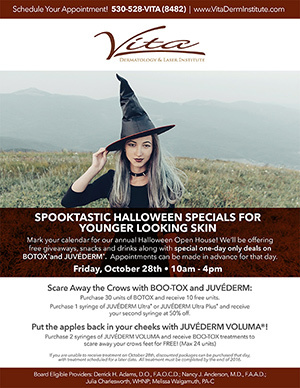 For one day only, on Friday, October 28th, 2016, from 10am to 4pm, Vita Dermatology in Red Bluff, will be having a Halloween Open House. They will be offering free giveaways, snacks and drinks along with special one-day only deals on Botox, Juvederm, and Voluma. » Put the apples back in your cheeks with JUVÉDERM VOLUMA®!